A still image from EPOXI shows the moon transiting (passing in front of) Earth. They are observed at different light wavelengths, which is why differences in details are visible. he first pictures of an Earth-like extrasolar planet will not be this detailed. Whenit comes to life as we know it, nothing is more important than liquid water.Now scientists have devised a way to spot water on distant planets that canonly barely be seen now, which in turn could reveal whether they might be ableto support life. Inthe past two decades, astronomers have detected more than 300 planets orbitingalien stars. Although most of these exoplanetsare gas giants similar to Jupiter, powerful space telescopes such as the oneaboard NASA's recently launched Kepler Mission will make it easier to detectsmaller rocky exoplanets similar to Earth. Seenfrom dozens of light years away, an Earth-likeexoplanet will appear in telescopes as little more than a pale dot. Now ateam of astronomers and astrobiologists has come up with a method to tellwhether such a planet harbors liquid water, using NASA's Deep Impact spacecraft. 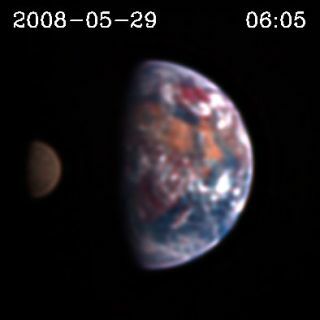 Theprobe was setto watch Earth on two separate days, March 18 and June 4, 2008. At thetime, Deep Impact was between 17 million and 33 million miles from our planetand directly above the equator. It measured the light intensity from our planetin seven bands of visible light, from longer redder wavelengths to shorterbluer wavelengths. Thescientists analyzed small deviations from the Earth's average color caused bysurface features such as clouds and oceans rotating in and out of view. Thiswas undertaken "as if we were aliens looking at Earth with the tools wemight have in 10 years" and did not already know Earth's composition,explained researcher Nicolas Cowan, an astronomer and astrobiologist at theUniversity of Washington in Seattle. Thelight coming from the Earth was summed up as just as a single pixel. Sinceclouds cover half our planet, for the most part that dot looked very gray.However, as each day progressed, the clouds rotated in and out of view,revealing the surface underneath, "and the color of that little speck oflight changed by some small amount, say 10 or 20 percent," Cowan told SPACE.com. Cowanand his colleagues found two dominant colors emerged, one at redderwavelengths, interpreted as landmasses, and the other at bluer wavelengths, judgedto be oceans. "Youcould tell that there were liquid oceans on the planet," Cowan said. Althoughsome non-habitable planets such as Neptune can also appear blue, in the case ofNeptune this color is likely caused by methane in the atmosphere. Cowan notedthere are clues that one can use to tell a watery planet from other kinds ofblue planet. For instance, Neptune "looks blue from every angle, the sameblue all the way around," he said. "For Earth, the blue varies fromone place to another, which indicates that it?s not something in theatmosphere." Scientistshave detected waterin the atmosphere of hot extrasolar gas giants in the past three years,"but you can't claim those are nice places to live," Cowan said. "If you found water on a rocky planet that is actually in thehabitable zone, not too close or far from the sun so that any water isentirely frozen or vaporized, that would be key, since liquid water seems to bethe thing needed for life." Cowanand his colleagues are scheduled to detail their findings in the August issueof Astrophysical Journal.